An excellent, free flowering species with star shaped medium sized flowers amethyst violet, heavily chequered with white on very short stems to 10cm in September and October. 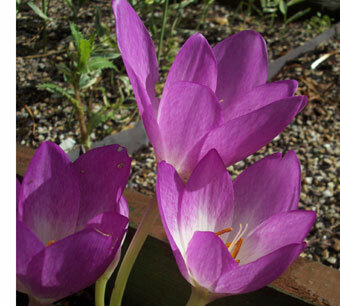 Flowers well for us in our alpine garden in full sun. 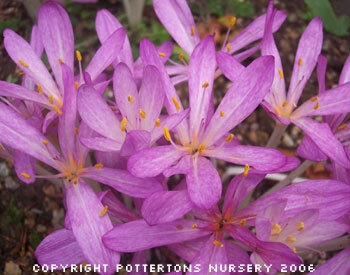 From each bulb several flowers are produced, very dainty soft mauve up to 10cm tall from August to September. Clusters of small white flowers, occasionally with pinkish tinges to the tips of the petals. 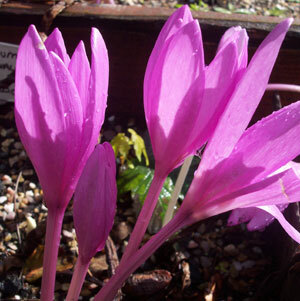 Very attractive and nearly always the first Colchicum to flower. (syn. pannonicum) A truly beautiful plant with richly coloured, violet mauve flowers to 20cm in September to October. 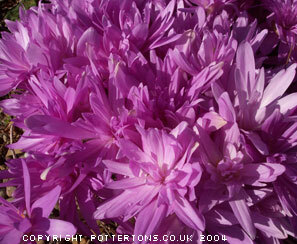 One of our favourite Colchicums, we have a large clump growing just outside the entrance to our kitchen door. 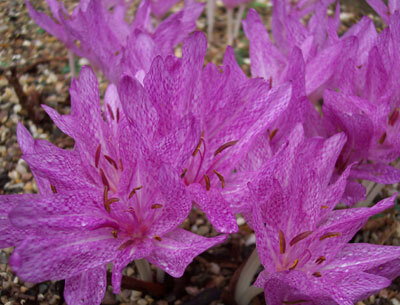 Each bulb produces several very large deep rosy-purple, heavily tessalated flowers in October. 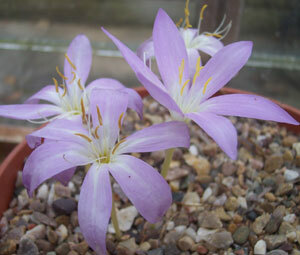 Several large distinct rosy-purple tessellated flowers with nicely contrasting white centres. Limited availability. 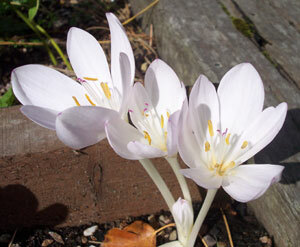 The early-flowering form of Colchicum speciosum which produces pale, almost white buds with a greenish perianth tube. Large flowers of pale rosy-lilac with white throat. Honey-scented, free-flowering species with bright petunia-purple flowers that are produces over a long period of time. Large, beautiful violet flowers on stiff stems to 20cm. 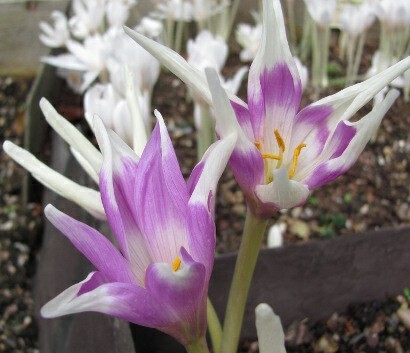 We offer this new cultivar for the first time, a unique colour break with flowers that are half purple-pink and ivory-white towards the tips of the petals. 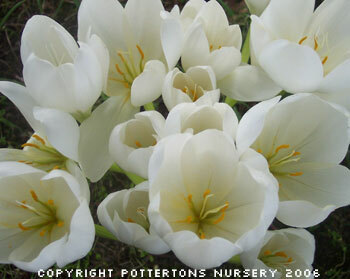 Clusters of usually white flowers in mid winter with distinct & contrasting black anthers. 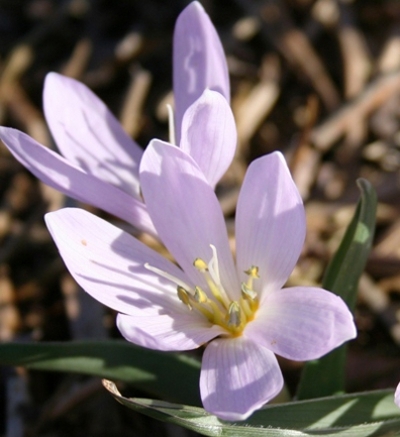 A recent new introduction raised from bulbs found on the Velebit mountains in Croatia. 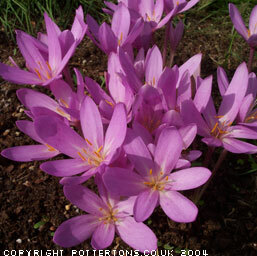 Choice, dwarf SPRING flowering species up to 10cm tall, produces two to six globular pinkish-lilac flowers with dark brown anthers from February to April, hardy. 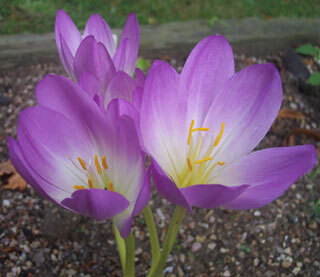 Lovely large amethyst-violet flowers with large white throat up to 15-20cm high in September to October. One of the showiest species which should be in every garden. Dark amethyst-violet flowers with distinct richly coloured purple stained stems, 20cm. Limited availability. 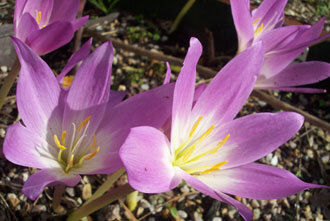 The largest double flowered Colchicum with spectacular and numerous narrow, amethyst-violet segments, very beautiful, 15-20cm. Always popular.